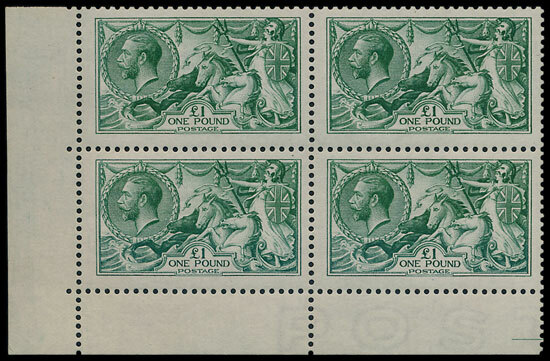 Buyers of Great Britain stamps can look forward to some great rarities in the November stamp auction. 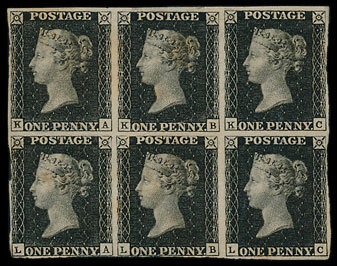 Outstanding lots include an 1840 1d black plate 5 mint block of 6, very rarely seen as a multiple of this size. The block has an SG Specialised catalogue value of £164,000 and has an estimate of £10,000 in the auction. Also from the Line Engraved issues, a 1d black plate 11, right side marginal, with part inscription. The stamp has a neat red Maltese Cross cancel. An 1840 2d pale blue plate 1 with original gum & accompanying Brandon certificate. From the Surface Printed stamps an 1867-83 £5 orange UM marginal, watermark anchor, overprinted ‘CANCELLED’ and described as ‘superb’. In the ‘Kings’ section a 1913 Waterlow Seahorse £1 in UM corner marginal block of 4 is estimated at £8,000. 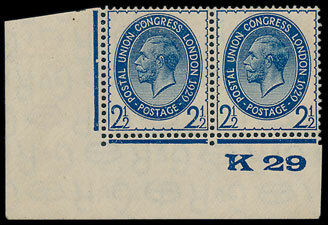 Believed to be one of only 6 examples, a 1929 PUC 2½ d corner marginal pair with control & inverted watermark. The online catalogue can be viewed here and viewing of the lots is available at Chalon House prior to the auction.